An American icon, woven in Pendleton’s Pacific Northwest mills since 1924. At Pendleton Woolen Mills, Clarence Morton Bishop envisioned a different kind of fabric for a man’s wool shirt. Pendleton’s sophisticated weaving capabilities were producing vibrant Indian trade blankets. Why not bring that same weaving and color know-how to woolen shirting? He wrote to his father, Charles Pleasant Bishop, "I believe we should add such goods as shirts and hosiery." C.P. Bishop agreed, replying "I am more and more impressed with the opportunity we have here in Oregon." While his son investigated production options, C.P. Bishop did the early marketing work. He wrote to his son that "I am impressing it on the minds of my employees and patrons...that we are putting a new fabric on the market, something better than other mills can or will make." 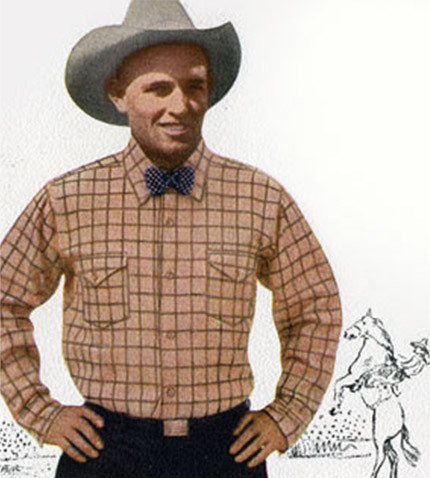 Shirt production was initially brisk, but slowed during the 1940s as much of Pendleton's fabric production capability was needed for uniforms and blankets in the war effort. After World War II, the concept of sportswear emerged in American society. This new concept of dressing was best explained as what Dad wore when he wasn't wearing his suit. While hunting, fishing, or pursuing his hobbies, Dad very often wore a Pendleton shirt. Throughout the 20th century, clothing trends have emerged from workwear and traveled into the fashion mainstream. The wool shirt was a perfect example. The American Look prevailed into the 1950s. Casual and colorful, leisurewear symbolized the end of privation and the return of the good life. In the early 1960s, Pendleton shirts hit the airwaves (courtesy of The Majorettes), whose song, "White Levis" became a number one hit in 1963. As the lyrics said, "My boyfriend's always wearin' white Levi's... and his tennis shoes and his surfin' hat and a big plaid Pendleton shirt." Levi’s and Pendleton have always paired up well, but wouldn't connect for a labeled collaboration for another 47 years. Soon after, a group called The Pendletones began to sing about the California surfing scene. They changed their name to the Beach Boys, but kept their uniform of Pendleton shirts worn over tee shirts with khakis. The band wore their blue and charcoal plaid shirts on the covers of 45s and LPs throughout the 1960s. 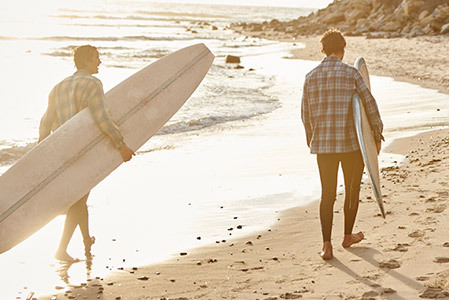 In 2002, Pendleton brought back the Board Shirt in the same plaid, re-named the Blue Original Surf Plaid. Because of its strong ties to surfing history and culture, this pattern was used in collaborations with Hurley and VANS in the late 2000s. The shirt is still going strong. Pendleton’s wool plaid shirts are more popular than ever with a diverse group of consumers. The Board shirt is still a favorite with surfers, and sported by snow and skate boarders as well. Car club enthusiasts know that nothing sets off their beautiful automobiles like the right Pendleton. And men who work outdoors still turn to the natural warmth, breathability and durability of wool as a first line defense against the elements. The Pendleton wool shirt has been featured in collaborations with Opening Ceremony, Comme des Garçons, Nike, Adidas, VANS, Hurley, Levi's and more. On the runway or on the waves, it's still a Pendleton. Over the years, styles, patterns and fabric weights have changed, but one thing remains the same; the consistent quality. Pendleton controls every step of production, from buying raw fleece, dying the wool, weaving fabric, cutting and sewing. Each Pendleton shirt is crafted from 26 to 38 different components. All pieces of a shirt are cut from one bolt of fabric for absolute color and pattern consistency. Meticulous attention is given to matching patterns, balancing collar points, collar linings, labels and buttonholes. Then, it's time for rigorous quality inspection and careful packaging. Pendleton wool shirts are sewn in either Umatilla woolen or worsted wool. Umatilla is a versatile midweight 100% virgin wool fabric that takes its name from Oregon’s Umatilla County, where Pendleton buys raw stock from local ranchers, and home of our Pendleton, Oregon mill. The softest wool you've ever felt. Lightweight and itch-free, our UltraFine Merino can be comfortably worn year-round. A mile of the lightest weight worsted wool yarn is used to make each of these finely woven shirts. This fabric is unparalleled for quality, drape, durability and is naturally wrinkle-resistant. Pendleton shirts are available in Classic Fit and Fitted, which is cut closer to the body.